Need food or housing assistance? Get help here. 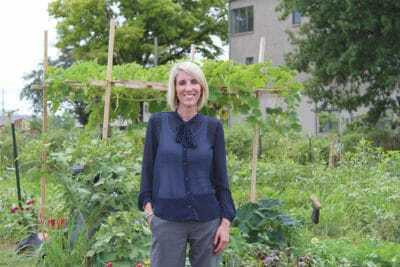 Nearly 3,000 people in Atchison County struggle to get enough food to eat. At times, they’re forced to make difficult choices between feeding their families and paying their rent. 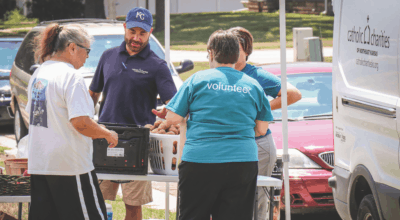 Catholic Charities of Northeast Kansas is here to help. Our Atchison Emergency Assistance Center (EAC) is available to low-income individuals and families who need food or assistance with basic utility payments, housing, clothing or medical prescriptions. The help goes beyond meeting immediate needs. An on-site case manager works to identify solutions and resources that will lead to long-term change. 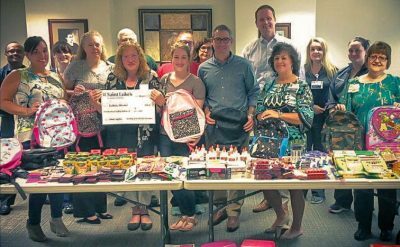 Although Catholic Charities had been serving Atchison and the surrounding area, it was determined that an on-site EAC could more directly meet the communities’ needs. In November 2013, we opened an office in a small space, using a closet to serve as the food pantry. As the demand for services grew, so did the need for a larger place. In February 2016, the EAC moved locations. Still nestled in the downtown community, the EAC now occupies an office that allows for a walk-thru pantry and spacious meeting rooms. This past fiscal year, our Atchison EAC experienced a 35% increase in the number of unduplicated individuals served. Housing and food assistance more than doubled, while utility aid and financial education quadrupled. 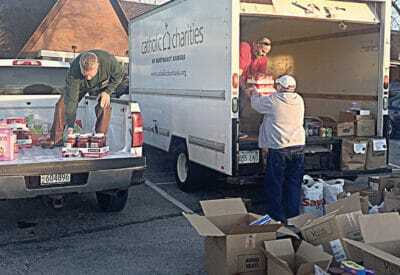 We could not assist our neighbors in need without the support and generosity of individuals, businesses, parishes and foundations who step up to organize food drives, make gifts-in-kind, volunteer in our food pantry and make financial contributions. We are truly blessed. Call for an appointment to learn what you will need to bring with you to receive services. All services are free and based on need – not religion, race or nationality. This information sheet in Adobe PDF format provides details about the Atchison Emergency Assistance Center that you can download. We value the dignity of those we serve, offering a self-shopping food pantry. Every 30 days, shoppers may pick items appropriate for their families’ dietary and cultural needs, choosing from a variety of high-quality, perishable and non-perishable foods including fresh fruits and vegetables. Every day, we offer bread to anyone who comes into our EAC in need of food. We also carry a limited selection of personal care items in our pantry including shampoo, soap, toothpaste, toilet paper, diapers, deodorant and laundry detergent. We help with basic utility and rent payments; vital prescriptions; and medical supply expenses. Also, we screen for safety net programs such as SNAP (food stamps) and WIC (Women Infants Children). 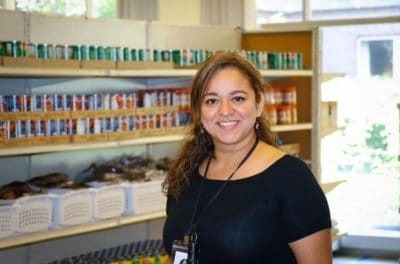 Whether it’s lending a helping hand at our food pantry, thrift store, men’s shelter or any one of our many programs, the assistance of our volunteers is necessary and appreciated. Volunteers are vital to the success of programs and services. With four hours of your time, you could mentor a refugee or migrant family as they acclimate to their new surroundings. With one evening, you could prepare and serve a dinner meal and socialize with the guests at Shalom House, men’s shelter. With four hours a week, you could greet and direct those in need of assistance at one of our Emergency Assistance Centers.